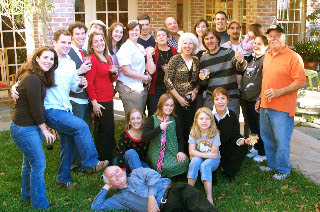 Scardino Christmas 2007 was wild and loud. It started with very festive red and green jello-shots that my usually sensible and sane attorney-sister Teresa brought. And Lo, on Christmas Day, a new family tradition was born. It sorta went crazy from there. We competed at ping-pong and god help us, karaoke. We debated over who brought the best wine. The gift exchange competition was a riot. I think I remember there was food.